Easy is a relative term. I seem to discover more and more how what is easy for one person is quite difficult for another. Perfect example is with me and crafts. Yes, all crafts. I am completely craft challenged. I try, and then I give up. Meanwhile, I’m a little better at cooking. 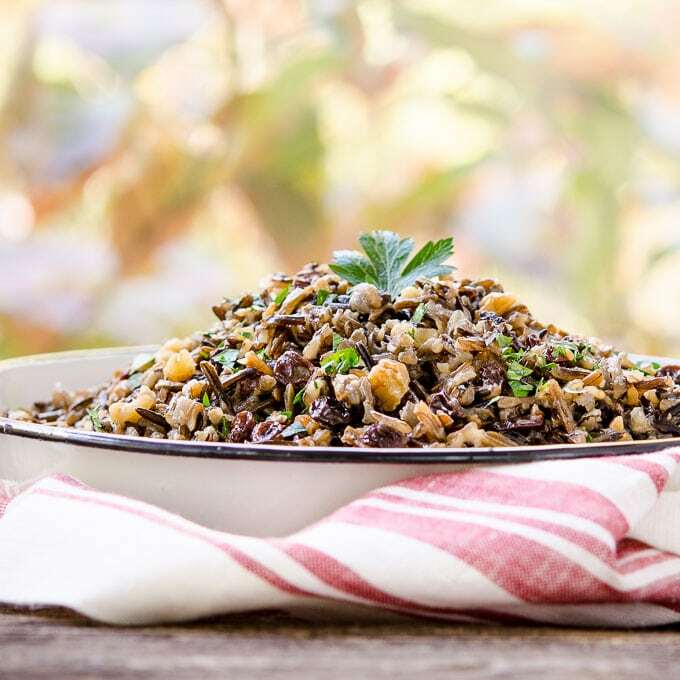 So when the theme of easy holiday entertaining came up, I decided to go with Fruited Wild Rice. It’s easy. At least I think so. Rice must be easy. It’s made and consumed by billions of people around the world. Only thing is wild rice isn’t actually rice. It’s the grain harvested from certain grasses. Yet it is cooked the same way. All you do is simmer it with some water until tender. Seriously easy. Get water to a boil, add wild rice, turn down the heat to low, cover, and simmer until tender (about 50 minutes). 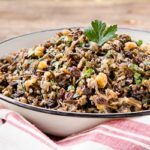 How to make wild rice special for the holidays? Add spirits. Yep, cheers to the holiday season. Even better is to have those spirits soak into a little fruit while it is cooking. While you are at it and feeling festive, you might as well toast some nuts. Hardest part of that is not letting them burn. It only takes about 5 to 7 minutes at 375°F to get most nuts nicely toasted. 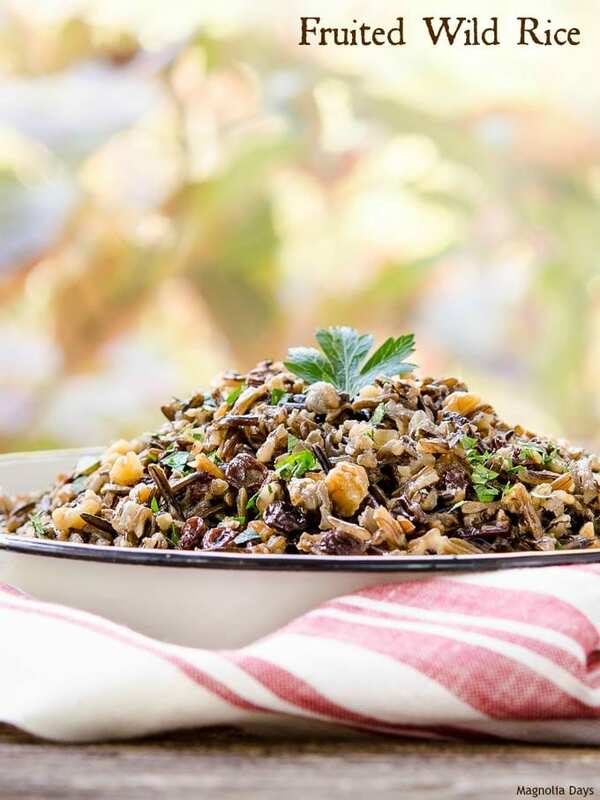 What all is in Fruited Wild Rice? The rice is cooked in vegetable stock instead of water. Stock adds a little extra richness and flavor. After it is done, you stir in walnut or olive oil, brandy soaked currants and toasted chopped walnuts. You let it sit for a few minutes then serve. Oh, for extra fruitiness you could use peach brandy. Either one works nicely. It goes wonderfully with ham, turkey, pork, or chicken. Do you entertain during the holidays? Even if things are rather busy and hectic this year, I suggest scrolling down to see the list of easy holiday recipes. Sunday Supper tastemakers have gone all out to help you make the best for not much effort. Set a date and call your friends and family now and invite them over. You can be the one to make the meal and treasured memories to go along with it. What else to make for the holiday entertaining? I happen to have a few recipes. Ahem. There’s the Self-Crust Coconut Pie (oh yea, no dealing with pie crust). How about a Honey Cola Baked Ham? For sure! Then use the ham leftovers and make Southern Ham Macaroni Salad. Oh, and of course the holidays would not be the same without Sweet Potato Casserole. Enjoy the season and make it as special as you can. Easy can be tasty too. 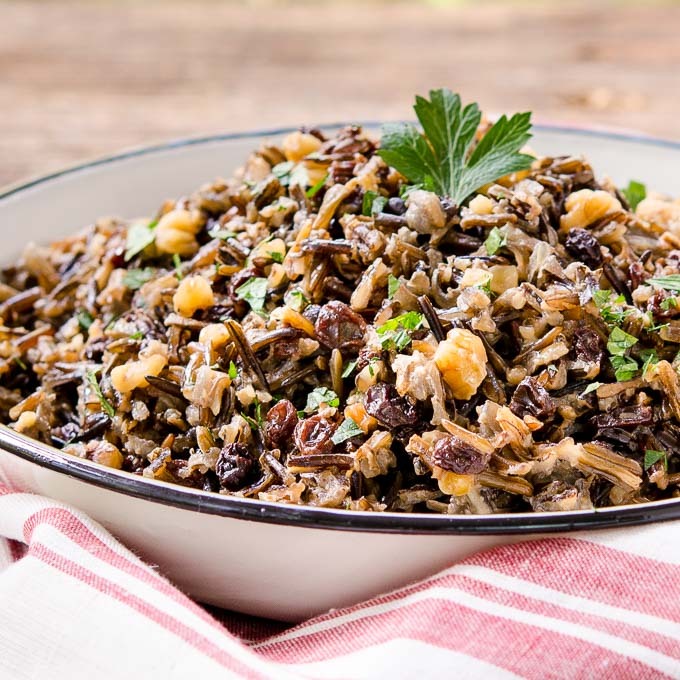 Fruited Wild Rice is filled with walnuts and currants flavored with brandy. It's an elegant, easy side dish to serve with turkey, pork, chicken, or beef. Stir together currants and brandy in a small bowl. Stir occasionally while rice is cooking. Bring broth to a boil. Add rice and stir. Cover and reduce heat to simmer until rice is tender, about 50 minutes. Drain rice if all the broth was not absorbed. Transfer rice to a serving bowl. Add currants, brandy, oil, and walnuts. Stir to combine. Let set for 5 minutes. Recipe adapted from one in the Southern Living Our Best Christmas Recipes cookbook published in 1994. This reminds me of my mom. She loved adding dried fruit to savory dishes! Such a gorgeous side that’s perfect with so many meals—from a weeknight to a holiday dinner! I love making my rice with stock. I love the additions of fruit and nuts in this, I have yet to make my own toasted nuts can you believe it? I can’t wait to try this, maybe the kids will eat it! All these flavors go so great together. Peach brandy seems perfect! 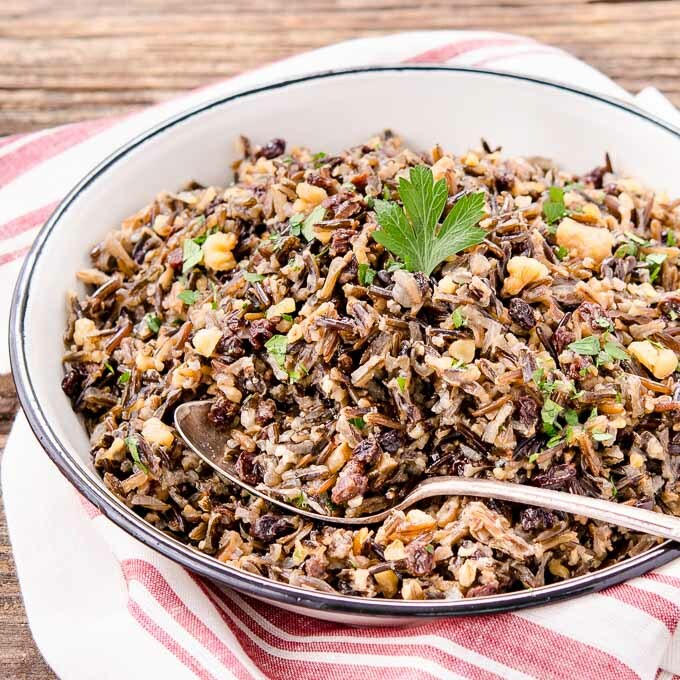 Wild rice does remind me of the colder seasons and I have always loved it, especially with seafood. Yours looks great, Renee! God this sounds amazing. Love the soaked currants. I need this in my life! What a delicious and flavorful side dish. This sounds absolutely fantastic. I will definitely have to give it a try!